A six-inch diameter stainless steel shaft driving a vacuum pump rated at 3000 cubic feet per minute suddenly broke into two pieces. 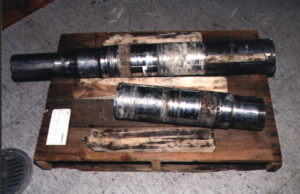 The broken shaft is shown in Figure 1; it was only in service for 11 months. Chemical analysis of the material revealed that it is an alloy of stainless steel – 410. The average hardness of five locations measured 32 on the Rockwell “C” scale. This translates to a tensile strength of 146,000 pounds per square inch, which is typical for this type of material. Examination of the fracture surfaces revealed that the shaft failed because of rotating bending fatigue. The shaft is driven on one end by a V-belt and pulley. The other end of the shaft, the free end, transmits no torque, and it was here, one half inch inboard of the rotor shoulder, where the shaft failed. The fracture surface is flat and perpendicular to the axis of the shaft. 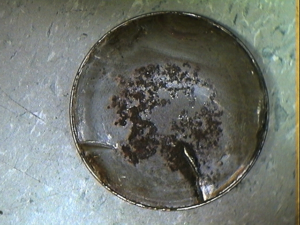 Several fatigue crack initiation sites were observed. The resulting fatigue cracks grew into the shaft after initiating on the surface. Examination revealed no material or mechanical defects that could be associated with fatigue crack initiation. Figure 2 shows the outboard side of the fracture surface. The shaft failure was originally attributed to high vibration caused by excess process buildup in the pump discharge ports. But there were no reported vibration problems or damage to bearings, and there was no significant drop in pump performance. I determined that the cause of the failure was shaft misalignment during installation. This was the only explanation that was consistent with the very short life of the shaft, the multiple fatigue initiation points around the shaft circumference, and the lack of other damage to the pump and its accessories.